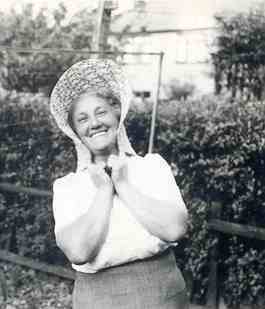 My Grandmother, known to us as Nanny Seguss, was born in Henstead in Norfolk. Her father was police constable in the Norfolk Constabulary and in 1901 he married Ellen Emily Osborne. My Nanny was the eldest of six children - Hilda May(1902), Nellie Emma(1906), Jack (1911), William(1912), Thomas (1916), Betty Joyce (1922). As you can see her youngest sister Betty was twenty years her junior. She is the only sibling that I remember. My Mum used to tell me the story of how the family lived in a bungalow alongside the Norfolk Broads. I do have an old photo of what appears a very small house. Apparently her father, in the course of his work’ arrested a man for possible horse theft and he and his ‘friends’ took it upon themselves to go round to the bungalow and ‘frighten’ the family. As a result of the incident the family moved to Woolwich in the early 1900s and her father joined the London constabulary. As Hilda grew up she worked as a ‘nippy’ in one of the Lyons tea houses. She married Alfred Seguss in Woolwich where they raised their family until their move to Lancashire so my Grandad could work at the newly built Royal Ordnance Factory in Euxton. My memories of Nanny Seguss are few as she died when I was 8 but I can remember spending Friday nights at 29 Broadway when I was a little girl whilst my older sister was taken for physiotherapy early on a Saturday morning. Nanny was a good cook, her steak and kidney pie, fruit tarts and egg custards were wonderful! She liked to grow Lupins and Pinks in her garden, could crochet and knit very well, she would crochet ‘net’ curtains for the windows at Broadway. When I recall her now I always remember her as a lady with lovely silvery white hair who always seemed to be wearing a wrap around type apron. I can remember sleeping in a large bed in the back bedroom and the street lamps in the road behind forming patterns on the wall through the net curtains. Although she spent her later years in Lancashire she always remained 'close' to her family in Woolwich. The things I do remember vividly as a child was that she was always smiling and full of fun. At Christmas we would always go her house and she would always have a Christmas bomb which was placed in the middle of the table and lit (No health and safety in those days!). As the fuse reached the bottom there would be a puff of smoke and small toys would fly everywhere! My mum would tell me that a couple of years before her death she suffered a stroke and lost her sight but went on to make a full recovery. She died very suddenly on Friday the 12th of February 1960, following a ruptured cerebral aneurysm. (Brain Haemorrhage). My memory of that day is one of Grandad coming to collect me as usual after tea and us walking back together to their house in Broadway via the small sweet shop on Golden Hill. As we reached the end of Broadway I ran ahead as usual, somewhere along the way I picked a bunch of ‘flowers’, I can’t imagine now what they were as it was February! I knocked on the front door and it was opened by my Nanny’s neighbour, Annie, who led me into the kitchen. I couldn’t understand why I couldn’t give Nanny the flowers and Annie hugged me and promised to give them to her as Nanny needed them now. After much hushed talking I was given a ride back home with Uncle Alf in a neighbour’s car where it was explained that my Nanny had died very suddenly. I remember for a long time after that having the same recurring dream of sitting in our dining room at home and Nanny tapping on the window, as she did when she came to visit us, and me opening the front door to find the porch empty. I like to think now that I inherited her love of crochet and just wish I could crochet in the fine cotton as she did. Looks like you passed the test!